Drumragh Sarsfields secured another brace of points with a fine win at home to Glenelly on Sunday last. Sean McGale opened the scoring with a well taken point in the first minute before Barry Fitzgerald increased the lead with a further point after 11 minutes with the home team squandering a succession of chances in a wasteful first quarter. Glenelly reduced the lead to the minimum after 12 minutes before the Sarsfields got into a rhythm and took some excellent scores. Further points from McGale (2), Martin Taggart, Benny Drumm and Shane Cleary with a solitary point from the away team let the half time score Drumragh 0-7 Glenelly 0-2. Drumragh began the second half with a flurry of scores as Shane Cleary added a goal and a point within the first five minutes of the second half with a superb Shane Devine major sandwiched in between them which effectively put the game to bed. 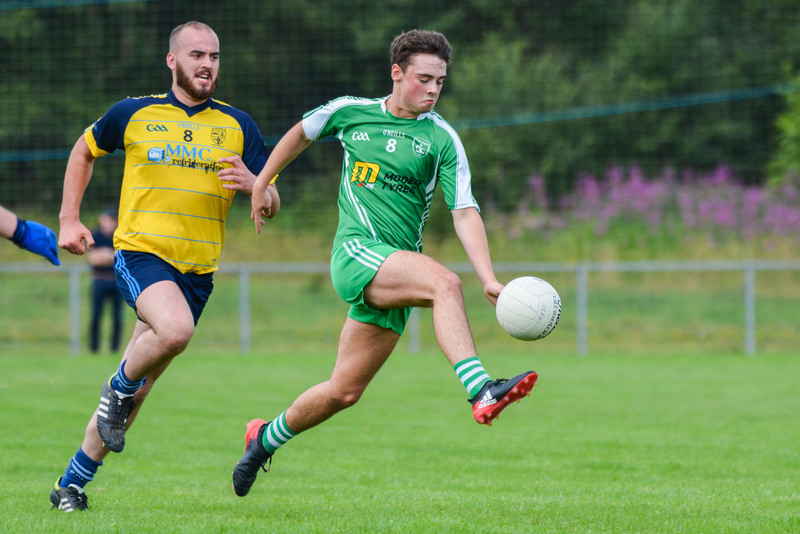 Glenelly added two points in the same period but further unanswered points from Aidy Colton, McGale and Cathal Gallagher increased the lead as the Sarsfields assumed control of the game in all sectors. Glenelly reduced the deficit with a point in the 40th minute before further points from Eamon Rea, Cleary and Fitzgerald eked out the home side’s lead still further. The last five minutes saw another flurry of scores for both teams with points from Devine, Rea and Cleary adding to the home side’s tally with the visitors adding two points before rounding off the scoring with a goal deep into injury time to leave the final score Drumragh 2-17 Glenelly 1-7. All in all another satisfying win for the Sarsfields with nine different scorers and each of the starting forwards getting on the scoresheet.